Unless they’re talking about a party. And if that’s so, where’s my invite? 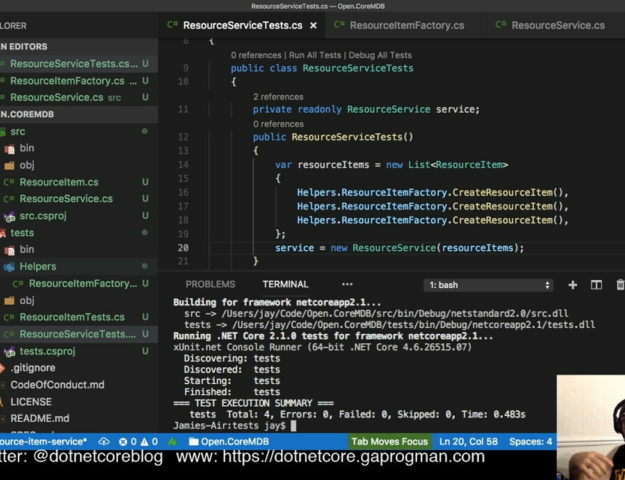 but in this post we’ll be looking at hosting a .NET Core application. There are even libraries for building GUI applications with .NET Core; things like Xamarin, GTK#, and the like. “brave” here because a lot of .NET devs (myself included) typically had little experience of Linux back in the early days of Mono. But now that .NET Core is cross platform, we can host our applications anywhere, right? Well, anywhere that’s running a compatible OS. I’ve already written about publishing a .NET Core application with Azure in the past, and Azure is pretty cool. running the latest stable version of the .NET Core SDK, and using nginx as our server. 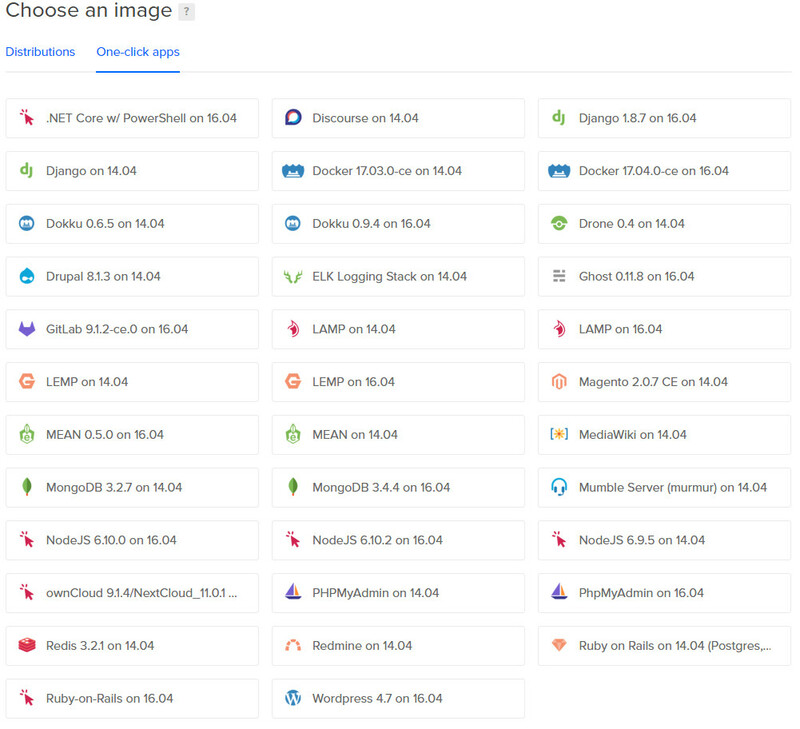 Digital Ocean are a cloud hosting company, they offer a wide range of Linux Virtual Machines and what they call “One Click Apps” (which are installs of common web applications). As with other cloud hosting providers (Azure, for example) there is a cost involved. Heading down the cloud hosted path, rather than hosting your web application yourself, could prove costly – especially if you end up having a lot of users. and each Droplet is self contained. Each Droplet is a fully hosted virtual machine running a distribution of Linux (the exact distribution is dependant on what you select when creating your droplet, obviously), and you are given complete control over it. As you can see from the above gif, there is a One Click App with .NET Core and PowerShell installed on Ubuntu 16.04, but I like to do things the hard way. Before we do any of that though, we need to make a few tweaks to the code that we’ll be using. Oh, I didn’t mention which of my .NET Core applications I was going to use to achieve this, did I? If you guessed dwCheckApi, then you guessed correctly. This will pull the code down to the directory we’re in, we’ll then need to change into the src directory (so that we can build in a moment). Now we need to alter the Configure method in startup.cs. We wont be using IIS as a reverse proxy (forwarding outside requests to localhost:5000 – which is where our application will be running), so we need to use the ForwardedHeaders middleware. One last thing that we need to do (which will save us time when we deploy) is to force the database to migrate on startup. There shouldn’t be any errors, but if there are you’ll need to fix them before we can continue. We’ll also need to check that the application still runs without any issues. Now that we know our application is running locally, we’d better publish it to our production environment. The first thing we need to do is create an account on Digital Ocean. You can do this by heading over to their homepage and running through the account creation wizard. You’ll need to provide payment details at some point in the account creation, Digital Ocean is not a free service, but it’s worth trying out for a month at the very least. Once you’ve created your account, you’ll need to create a droplet. and you can do after you’ve logged in by clicking the “Create Droplet” button. back when I started playing with Digital Ocean, I chose the $5 level and it was more than enough. Your mileage may vary, depending on what you want to do with your Droplet though. a data centre region (you’re better off picking on that’s geographically near you for faster upload speeds), add an SSH key and give the droplet a host name. I chose Ubuntu 16.04.2 when I was experimenting with Digital Ocean because I’ve been using Ubuntu (on and off) since version 7 was released. In fact, it’s my daily driver OS on my main home PC. We’re going to use SSH to communicate with our new Droplet, so it might be worth taking a few minutes to get an idea of what it is before moving on. SSH stands for Secure Shell, and is a protocol for connecting to a remote computer and issuing it commands. All of this is done over a connection using public-key cryptography. SSH is used by most system admins as a way to remotely running commands and scripts on the machines that they manage. We’ll do, pretty much, the same on our droplet. Depending on the operating system that you’re running, you might have to install software to allow you to connect to a remote machine using SSH. If you’re running Windows, you’ll need to install something like PuTTY; but if you’re running MacOS or a Linux distribution, then you can connect from the terminal. You’ll then be prompted for the SSH key or password (if you didn’t create an SSH key, then a password will be generated and emailed to you) and you’re in. In a real environment, you would create a non root user and use that one to connect to your Droplet. But, for now we’ll use the root user. The instructions for installing .NET Core on Ubuntu 16.04 are available on the .NET Core website. 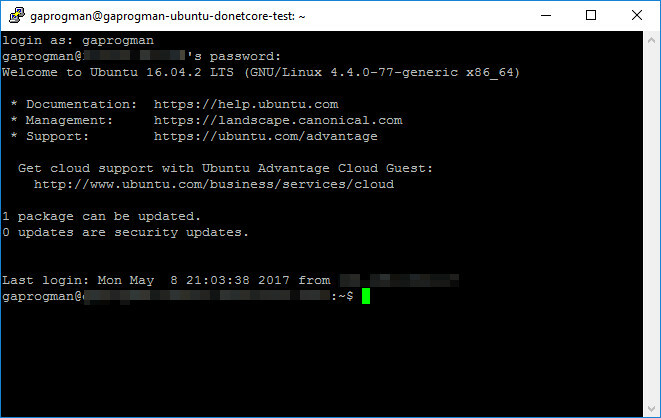 The above commands will add the .NET Core packages and Key server to Ubuntu’s package source lists. 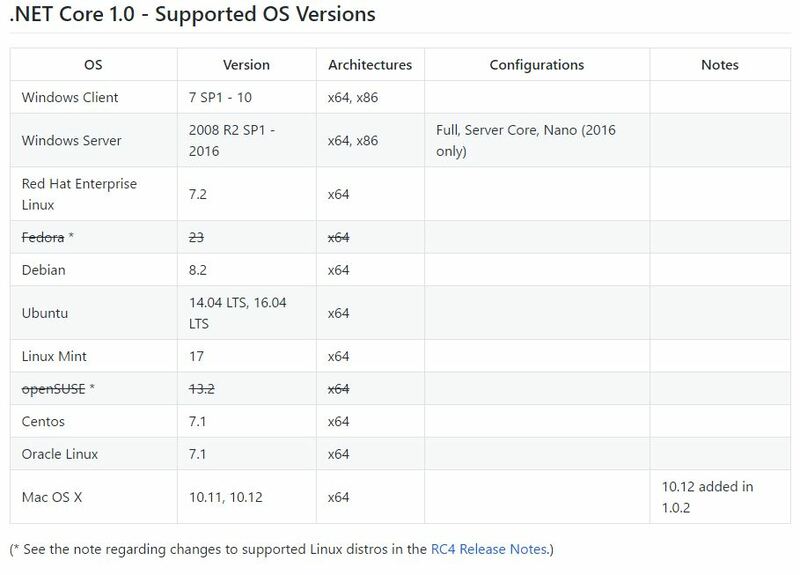 Incidentally, as this post was being edited and proof read (I do this a few days before going live), Microsoft pushed the packaged for versions 1.0.4 and 2.0.0 Preview 1 – as a result of announcing them at Build 2017. Nginx is a lightweight web server with support for reverse proxying, and it’s what we’re going to use in place of Kestrel. We’re not going to use Kestrel because it is not ready to be a web facing web server. There are a lot of insecure things that Kestrel does at the moment, and Microsoft do not recommend using it on web facing applications without a more fully functioning web server sat in front of it. The most important reason for using a reverse proxy for edge deployments (exposed to traffic from the Internet) is security. Kestrel is relatively new and does not yet have a full complement of defenses against attacks. This includes but isn’t limited to appropriate timeouts, size limits, and concurrent connection limits. Since this is a demo project, and we’re not dealing with sensitive requests, we can allow HTTP for now. what we’ve done so far shouldn’t affect the SSH rule, but we’ll explicitly add it here just in case. Anecdotally I was unable to connect via SSH with a different Droplet and it turned out that I’d wiped out the SSH rule. Talk about whoops. 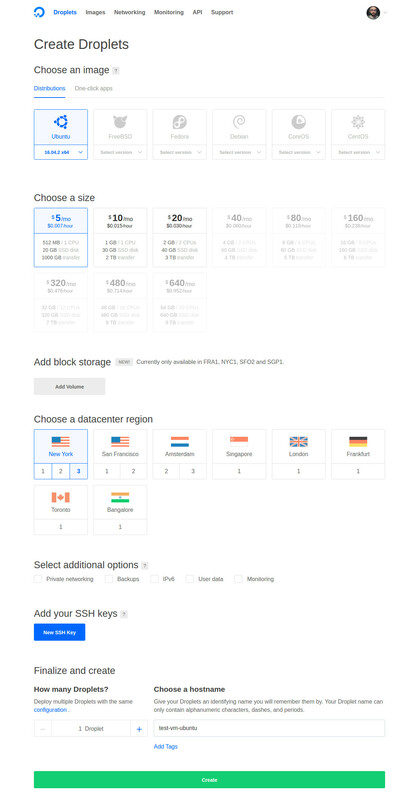 We chose Nginx because it has support for reverse proxying, so let’s set that up now. I’ve removed everything that isn’t a useful comment or a configuration option. The best option here is to make your config match mine. Once you’ve done that (and double checked it), you can save your changes with Ctrl+X and selecting ‘y’ (to overwrite the file). We’ll need to install our application somewhere, so let’s store it in it’s own directory. We’ll choose var as the parent directory for now. Stands for variable. A place for files that may change often – especially in size, for example e-mail sent to users on the system, or process-ID lock files. Framework-dependent deployment. 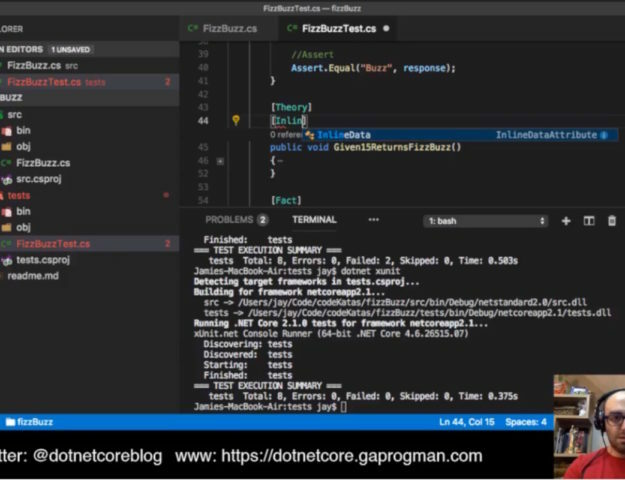 As the name implies, framework-dependent deployment (FDD) relies on the presence of a shared system-wide version of .NET Core on the target system. Because .NET Core is already present, your app is also portable between installations of .NET Core. Your app contains only its own code and any third-party dependencies that are outside of the .NET Core libraries. 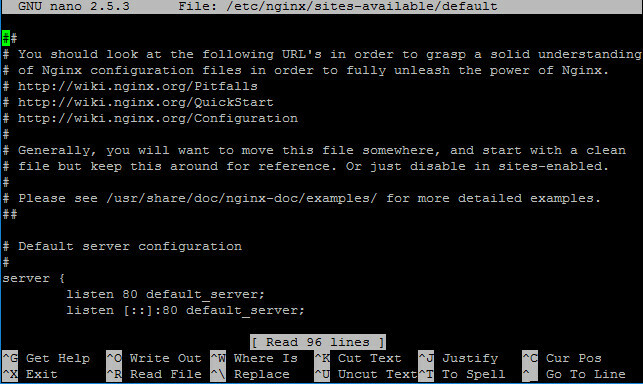 FDDs contain .dll files that can be launched by using the dotnet utility from the command line. 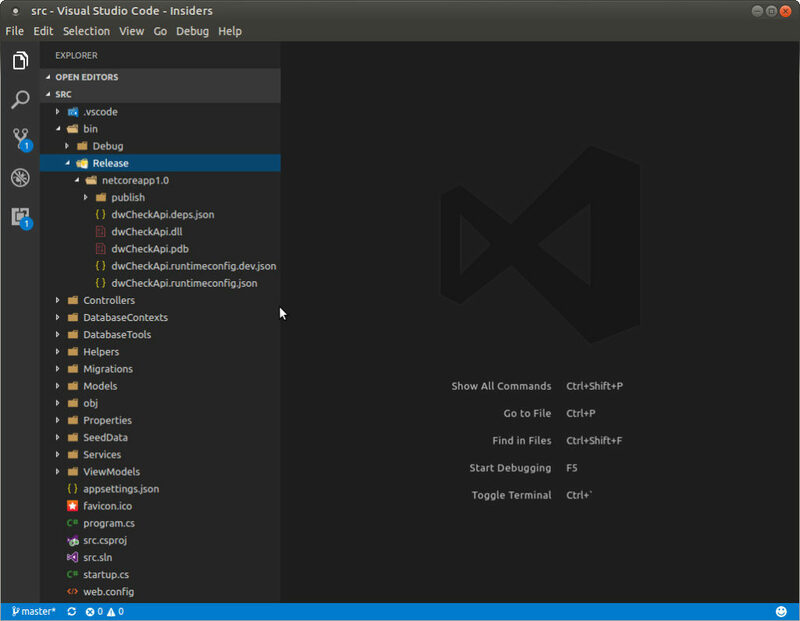 For example, dotnet app.dll runs an application named app. Self-contained deployment. Unlike FDD, a self-contained deployment (SCD) doesn’t rely on the presence of shared components on the target system. 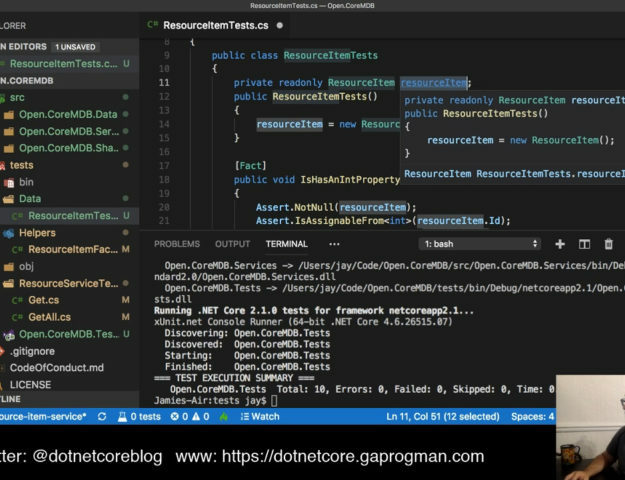 All components, including both the .NET Core libraries and the .NET Core runtime, are included with the application and are isolated from other .NET Core applications. SCDs include an executable (such as app.exe on Windows platforms for an application named app), which is a renamed version of the platform-specific .NET Core host, and a .dll file (such as app.dll), which is the actual application. We could build either of these release types, but since we already have .NET Core installed we’ll build an FDD version. This will give us the added bonus of being a much smaller deliverable which, in turn, will have a much shorter upload time. We now need to send the files up to the Droplet. 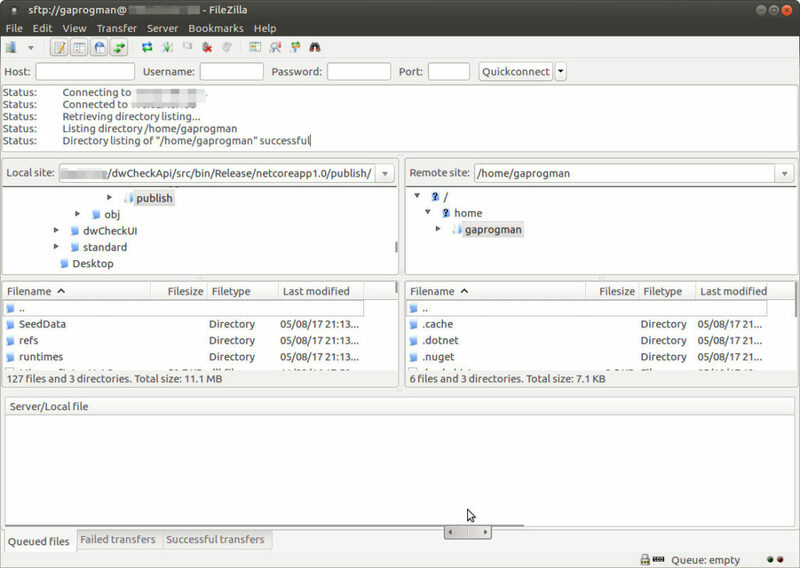 We’ll use FileZilla to create an SFTP connection to the server and publish our application to the directory we created (in the previous section). 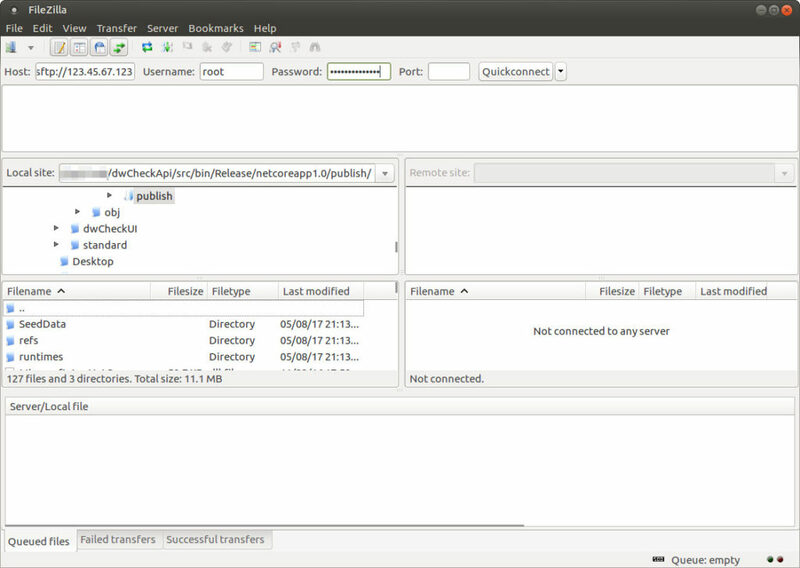 Once you’ve supplied the connection information, click “QuickConnect” and FileZilla with establish an STFP connection. You’ll be asked if you want to trust the unknown host key, this is because FileZilla will have never connected to this server using the host key returned. Click “OK” and your connection will be complete. and in the lower right window (labelled Remote Site) navigate to ‘/var/your-app-name’. As a pro tip, if you know the address of the directory you want to navigate to, just type it into the dropdown above the relevant directory listing. 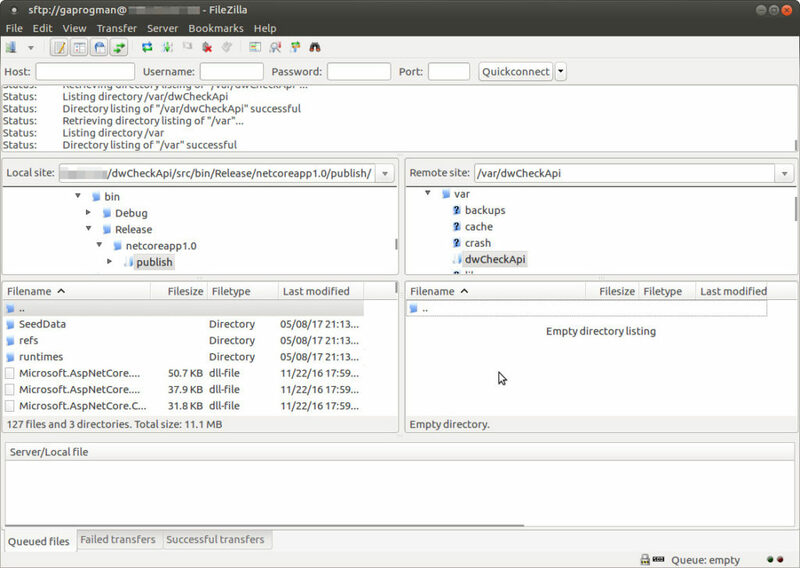 FileZilla will start the process of uploading the files to your Droplet. can SFTP be a verb? you’ll have to substitute ‘dwCheckApi’ for the name of your app (unless you’re using dwCheckApi to play along). the running application will be closed. This is because it’s running via the SSH connection. To enable our application to stay alive after we’ve closed the SSH connection, we’d have to use a service. I’m a little reluctant to throw in extra content about services and how to set one up so that our application continues to run. However, there is an article in the .NET Core documentation about this very thing. You can read it here, if you wish. 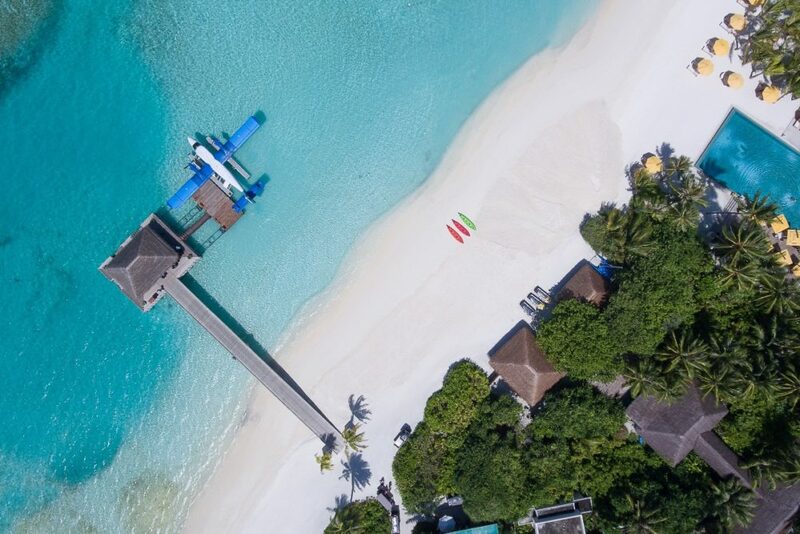 There’s a little more set up involved with publishing to a Digital Ocean Droplet rather than publishing to Azure. However, if you’re not running Visual Studio on Windows or on MacOS, then you’ll have to publish to Azure via SFTP anyway. I really quite having to run all of the commands and build up my server by hand, but that’s personal taste. There’s a lot to take in here, but it’s worth knowing. At the very least, it’s worth knowing how to setup a .NET Core application on a non-Azure Cloud VM. At least, in my opinion it’s worth knowing. I apologise for the sheer length of this post, but I wanted to be a little thorough where I thought it necessary. Also, this post is my longest yet (clocking in at 3.5 thousand words). For those want to try out a Digital Ocean Droplet, you can use this referral link and get $10 of credit on me, when you create you’re account.